I know I’ve been going on and on about fall, I love fall, can’t get enough of fall, for weeks. Well, I’m not done yet. I’m savoring every moment because this gorgeous weather won’t be around much longer. Soon the leaves will be on the ground, the air will have an unpleasant bite and we won’t linger outdoors to enjoy the rapidly disappearing sunshine. 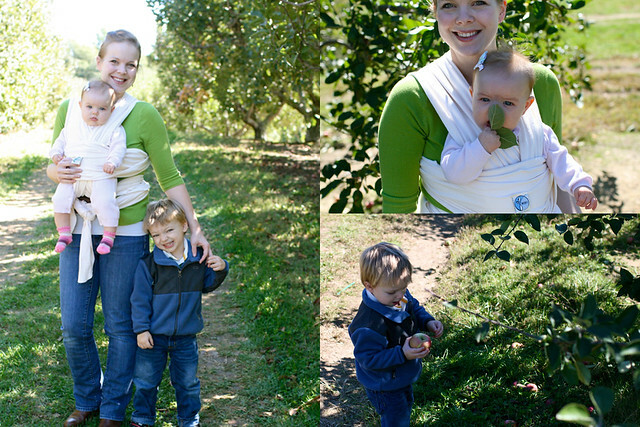 Since Andrew was born, visits to our local apple orchard have been a yearly tradition, and they are one of my favorite things about this season. I’ll confess I look forward to the apple cider slushies almost as much as the apples themselves :) More than that though, we love the time together, walking (or in Andrew’s case, running wildly) through the rows of trees, picking apples to bring home. As always, my eyes are overly optimistic as we take the largest bag the orchard offers and fill it to the brim. Then we get home and I wonder, what on Earth am I going to do with all these apples? Normally when we go apple picking I have all sorts of fancy things planned for our bounty like turnovers (drool) or danish. This year though, I had nothing planned. We went more for the sake of fun and tradition than because we really needed apples. I also had zero time to do anything remotely involved. A few days after picking, there was still a massive bag of apples sitting in our house staring at me, despite Andrew repeatedly grabbing one, taking four teeny tiny bites and then demanding a new apple. Ahh, toddlers. Anyway, I needed something quick and simple that would also use a lot of apples. 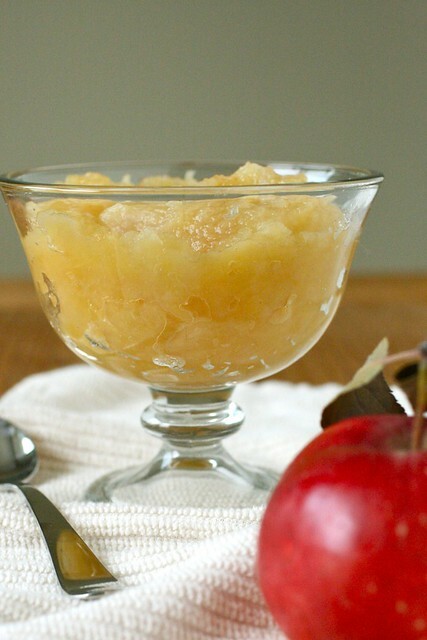 Hello, applesauce. Such a simple, basic food that we all know and love. It smells so wonderful while it simmers on the stove, and eating it makes me feel like a kid again. I was tempted to add in some frozen cranberries, but in the end I opted for simplicity to let the apples really shine. The cinnamon sticks add just a hint of warmth and spice. Andrew asked for bowl after bowl of applesauce throughout the week until it was gone. I’m hoping all these orchard trips and yummy fall food infuse him with tons of great memories so that he might share my love for this beautiful season. Peel, core, and roughly chop the apples into large chunks (about 1½-inch pieces). 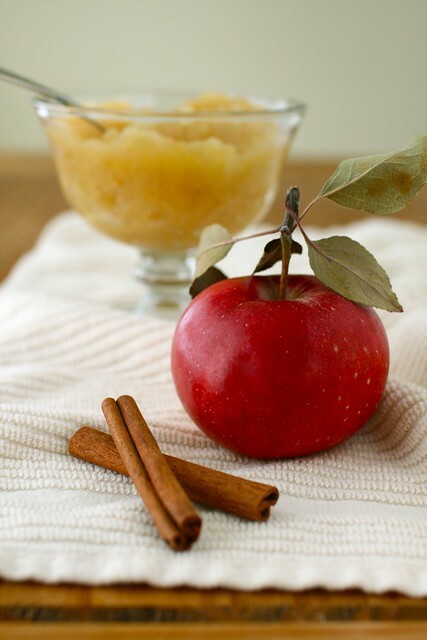 Add the apple pieces to a Dutch oven with the water, sugar, salt, and cinnamon sticks. Bring the mixture to a simmer over medium-heat. Cover the pot and continue to cook at a simmer until the apples begin to break down, about 25 minutes. Stir occasionally with a wooden spoon, mashing the apples. Remove the cinnamon sticks. If desired, transfer to a food processor and puree until a smooth consistency is reached, adding water if necessary to thin it out. Alternatively, simply mash with the wooden spoon for a coarser texture, adding water as needed.